If you are short of time, the answers to the following 3 questions should let you know all you need to about the Waterpik Sensonic Professional Plus SR-3000. If I have missed something, let me know in the comments. If you want more detail, you can read our full Waterpik Sensonic Professional Plus SR-3000 Review further down the page. Far from it. It is a strong performing electric toothbrush, that exceeded my expectations. The price and features of the SR-3000 means there are quite a few different options you could consider. Our recommendation is to consider the Sonicare ProtectiveClean 4100 or 6100 series. One is a little cheaper, whilst the other a bit more expensive, but they both address the main criticisms of the SR-3000. For a more detailed comparison of the top brushes currently on the market, see our electric toothbrush buyer’s guide. 3. Where is the best place to buy the Waterpik Sensonic Professional Plus? Whilst Waterpik is stocked by a number of large retailers that you likey shop at, their toothbrush is not quite as easy to source. We have included a live price comparison below of online retailers that are stocking the SR-3000. It’s always worth checking eBay as well. Waterpik are a US company best known for their water flossers. They have a comprehensive range and are the market leaders within this space. However, they do make a couple of electric toothbrushes, the SR-3000 or Sensonic Professional Plus as it is better known, is the brush I am reviewing here. It’s their flagship model. Given Waterpiks experience in toothbrush production and the strong competition from the likes of Sonicare and Oral-B, my expectations were low. However, I am to be proven wrong, their high standards in water flossing has transitioned to the toothbrush. Here are what I consider to be the main pros and cons with the Waterpik Sensonic Professional Plus. 2 cleaning modes – A high and low speed cleaning mode, giving choice for users. Brush heads – Different sized brush heads provided, suitable for different mouths. Timed Clean – Built in 2 minute timer and 30 second quad pacer, with automatic power off. Box contents – Box contents is better than I had expected. Design – Functional, but feels a little dated. Battery Life – Up to 7 days life or 28 minutes of usage time which is weak in comparison to the Sonicare alternatives. This might not be the first thing that you notice about the brush, but my personal view is that the design of the brush is a it dated. It looks a little cheap and doesn’t inspire like some of the other brush handles on the market today. Now whilst on one hand I criticise the look, I do on another have to compliment Waterpik for sticking with a practical and functional approach. Different target markets and price brackets, but the Sonicare DiamondClean range is a prime example of where style and design takes priority. In some respects in the case of the DiamondClean the design priority has overlooked some of the basic usability. The Sensonic has no over complicated design, but instead a setup that works. It feels fairly solid and well built in hand too. On the front is a Silver colored power button sat inside a ovalish shaped piece of Blue rubber. This sits in the upper third of the handle. It is the most common location for the power button and with a convex design, it does too stand proud of the brush handle, which makes it easy for the fingertip to locate. The surrounding rubber grip gives a place for what is usually the thumb to rest and control the brush when in use. In the lower third of the brush hande is the battery status/charge icon. 3 LEDs are stacked on top of each other within a Black oval panel. At the end of each cleaning session, or when removed from the charging stand the LEDs light up. 3 Green LEDs mean it is fully charged. 2 Green LEDs mean 66% or less power remaining. 1 Green LED mean 33% or less power remaining and a charge is recommended. On the sides of the brush handle, in a slightly wavy formation wrapping to the front and rear, is a piece of Blue rubber, this acts as a grip and keeps the brush firmly in hand. Some brushes lack these essential grips and it is not until you use a few different brushes do you really appreciate their presence. The remaining handle, front and rear is made of a White colored plastic and is smooth to the touch. On the base of the brush is a slight recess (not to accommodate a charging pin as is the case with many other brushes) but to release the end cap and gain access to the internal components. There is no need to open the brush. Doing so may invalidate the warranty and is designed only for safe disposal of components at the end of its working life. At the top of the brush handle, is of course the brush head. The brush head is detachable and interchangeable. The heads simply slide on and pull off the metal shaft that extends from the motor inside the handle. It is this shaft that delivers the motion to the bristles of the brush head when the brush is switched on. 3 brush heads are provided in the box. The names are perhaps self explanatory, with a larger, smaller and specialist interdental head. Unlike Oral-B brush heads which are round, the Waterpik heads, the exception being the interdental are more rectangular like a traditional manual toothbrush. This means that they cover more surface area in the mouth, but can potentially be a little more difficult to move about and position due to their size. It is the compact head that can overcome this maneuverability issue in many cases. Looking closely at the bristles you will see that they are cut at different lengths and angles to ensure a great all over clean. Each individual bristle is rounded at tip to be soft on the teeth and gums and not do any damage to your mouth. I actually found the clean to be very pleasing overall and extremely similar to a Sonicare brush. No complaints here. The interdental brush is a little different in that the bristles taper to a single point to clean in between the teeth. It does work, but truthfully I prefer regular floss, or of course Waterpiks water flossers over the use of these. Personal preference though. Heads are sold in packs of 3 and cost $20. You can save a few dollars if you shop around. You should replace the brush heads every 3 months. The internal motor offers up to 30,500 movements per minute. There are 2 cleaning modes available, a low and high speed setting. Press the power button and it launches into the slower mode. Press it again and you are into the high speed mode and get the full power of the motor. This is good as it caters to different needs. Sometimes our mouths can be a bit more delicate and the full power can be too intense or invigorating. As I suggested the clean was good and I was surprised at how well it did. When running the brush produces a loud humming sound like any other electric toothbrush. By powering the brush on, you also activate 2 different timers built into the brush handle. The first is the 2 minute timer. Found on most electric toothbrushes, it falls in line with the dentist recommended 2 minute cleaning time. The idea is it helps you brush for the right amount of time. Until you get the notification that the 2 minutes are up, you know you have not brushed for long enough. The SR-3000 gives its notification by actually powering the brush off. I love this feature. It is a clear sign the brushing is over and it conserves battery life too. What this does not do, is ensure you brush evenly in the mouth. A popular cleaning technique is to break the mouth up into 4 sections. You spend 30 seconds cleaning each. This is where the 30 second pacer or quadpacer as it is also known comes in. It gives you the alert when 30 seconds is up, so you move to the next one. This way, after 2 minutes, you should have given a fairly even clean to all the teeth in the mouth. The 4 sections are upper right, upper left, bottom right and bottom left. If you are not used to a timer like this it is really helpful. It will take some practice but you will soon become aware of how to brush evenly and perhaps realise if you were doing it wrong before. The SR-3000 will, at 30 second intervals pauses very briefly. You will hear a change in sound and seel or feel a pause in the brushing action. When you do, you know that it is time to change quadrant. If the Professional Plus is to be your first electric toothbrush, do be aware that they way you brush is different to a manual toothbrush. You move the brush tooth to tooth and the bristles do the work. You need not move the brush at a rapid pace up down and around the teeth. The bristles of the brush head need only skim the tooth surface, you don’t need to scrub them. Many people brush too hard and this is a problem as it can lead to accelerated tooth and gum wear and cause problems later in life. It would be nice if the SR-3000 had a pressure sensor, like the Oral-B Pro 1500 or 3000, but sadly it does not. This is not a big issue, but it’s a nice feature that I feel would add even more value to the brush. The built in battery will keep you powered for 7 days between charges and the provided stand makes it easy to top up. Although the brush handle is water resistant, it is not waterproof, so avoid using in the shower. It will happily survive a rinse under the tap as part of regular cleaning. For those who like to travel you will welcome the addition of a travel case. A basic plastic construction it holds the brush handle and up to 2 heads, protecting them from damage and accidental activation. Considering the very limited number of brushes Waterpik have made, they certainly know how to do a good job, the Sensonic is quite impressive. If I were to ask any random individual to name 2 brands of electric toothbrush, the most common response is likely to be Philips Sonicare or Braun Oral-B. Therefore it is perhaps reasonable to make some form of comparison to them when it comes to battery life. There is actually a little disparity between them. 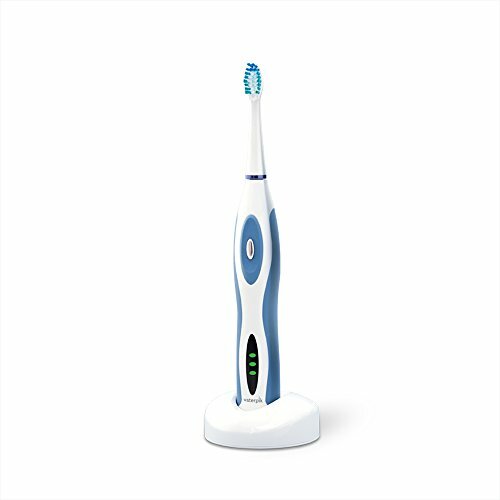 Most Sonicare models offer 2-3 weeks battery life whereas most Oral-B brushes offer just 7 days. The Sensonic Professional Plus is most closely matched to Oral-B, with a typical life of 7 days, based on 1 user brushing their teeth twice a day for 2 minutes. That equates to 28 minutes of running time or 14 cleaning sessions. Inside the handle is a Nickel Metal Hydride (NiMH) battery. Many argue, for good reason, that this is an older battery technology and that it is. Both Sonicare and Oral-B still use it, as it is tried and tested, and on the whole reliable. They do tend to have a shorter working life than the newer, more desirable Lithium-Ion batteries but, its not fair to criticise Watepik too much for this, given the leading brands still use them. That said, both are moving away form them. So, for your own good, whilst it is ok to leave the brush on the charging stand, charging, perhaps unplug it when you know it is fully charged. Doing so will avoid the continual push of charge into an already full battery. It might just prolong the life a little. Of course comparable to Oral-B based on the running time, Sonicare puts both brands to shame here a little. Not a big issue for most. But, if you travel frequently, perhaps for a week or more at a time, then this might be a consideration. It may well be feasible to take the charging stand with you. The one supplied with the SR-3000 comes with a 2 pin adapter suitable for the US, but has voltage support of 110-240v. What this means is whether you travel to Canada, the UK, France or Australia, all you may need in addition to the charging stand is a plug adapter. No need to worry about fiddly voltage adapters. It can take up to 24 hours to charge the brush fully. All you need do, is plug the stand in and place the brush in the centre and it will stand upright. On the front of the brush handle are 3 LEDs that give feedback on the charge within the battery. The lights will be lit for approximately 10 seconds after use and after removal from the charging base. If the lower of the 3 LEDs is flashing rapidly, the brush will not turn on. It is out of power and needs at least an hour on charge before it can be used. 3 Green LEDs means it is fully charged. We included a live price comparison of US retailers here at the start of the review. All product manufacturers have a price that they suggest their product should be sold at. In the case of the SR-3000 Sensonic Professional, that price is $89.99. My initial reaction to this is not one of great surprise. It seems about right, based on its features and the suggested selling prices of competing products. Many electric toothbrushes are often sold at a discount though. Perhaps driven more but the particularly competitive online market, than your typical stores. Oral-B are perhaps the biggest perpetrator of this, with most selling at 30% or so below the retail price. Philips Sonicare discounts tend to be much smaller, 10-20% under the price, if any discount at all. So, what price does the Professional Plus sell for? Perhaps unsurprisingly, if you head to Waterpiks own online store you are going to be paying $89.99. Head to Walgreens and that price drops to $75. Buy from Amazon and that price drops further to just $60 (correct at time of review). With little in the way of effort is possible to save over 30%. 3 different brush heads might come supplied in the box, but there will come a time when you need new ones. A pack of 3 has a retail price of $19.99 so just over $6.50 each, but again it is possible to save an extra $1-2 (per head) or so by shopping around. Using the lowest prices available at the time of writing (based on one user) and ownership over 3 years , the SR-3000 will cost $115 or 11 cents per day to own. When purchased at these prices, the brush is pretty the same price as the key competing brushes from Sonicare and Oral-B. Share brush handle with another user to extend value. This like any other brush goes through our hands on testing here at Electric Teeth. We do not, put them through specialist machines to test their durability and strength, but actually test them like you would at home. We use it, compare it to others and take our experience of other brushes available on the market today to draw comparison and conclusion. Waterpiks water flossers are generally pretty reliable products. Being the first toothbrush of theirs I have tested, it is not as easy to make comparison as its an entirely different type of product. I don’t think it is the most solid, or best quality brush I have ever used, but then it’s far from the worst and I have no overriding concerns. The weakest point is likely to be the battery. A few weeks on test does not necessarily show such, but after repeated charges and discharges it is possible the NiMH could fail. Should it or anything else go wrong on the brush, not as a result of user damage, then the provided 2 year warranty should have you covered and give you that extra peace of mind. I have to be honest, Waterpik have surprised me. For what is really their first proper attempt at an electric toothbrush they have done a fantastic job. They have clearly seen what others do well and implemented such into their brushes. Upon reflection, I should have given them more credit. Their attention to detail and quality is apparent in their water flossers, so why not in their toothbrush. Personally I feel the design is a little dated and the battery life could be a bit better, this is why the ProtectiveClean 4100 is a good alternative. But, I am being picky and all things considered, I don’t think you will be disappointed. Is the Waterpik Sensonic Professional Plus SR-3000 an oscillating brush? The SR-3000 comes with 1 x standard brush head (SRRB-3W), 1 x compact brush head (SRSB-3W) and 1 x interdental Brush Head (2SIP-2W). These are the only 3 styles of head available from Waterpik. Does the SR-3000 have a pressure sensor? Does the Sensonic Professional Plus have Bluetooth? Does the Waterpik Sensonic Professional Plus SR-3000 come with a warranty & how long is it? Does the Sensonic Professional Plus have a built in timer? Yes. Often referred to as the quadpacer; subject to the cleaning mode the brush will provide an audible warning through a slight pause in the brushing mode to tell you to change quadrants. There are 4 quadrants to the mouth, and brushing is normally for 2 minutes. The timer will active at 30 second intervals, with the brush powering off after 2 minutes. Yes, a charging station is included with the Waterpik Sensonic Professional Plus SR-3000. The Sensonic charging station or brush head holder has not been designed to be fixed to a wall. Can I use the Pro 5000 in the shower? No. Whilst the handle has a level of water resistance, I would not recommend use within the shower. Do you own or have you used the Waterpik Sensonic Professional Plus SR-3000?